There has been a lot of talk lately about the importance of online reviews. Many folks use Yelp, Angie's List, Google + and others to look up customer reviews before they make a major purchase. If you need a doctor who is a specialist, a review site called Healthgrades was introduced. If you are looking for a good local restaurant, most people look it up on Yelp first. Depending on the business that you are looking for, chances are there is a review site for that type of business. In the wedding industry, the top online review sites are Wedding Wire, Yelp and Google. Myth #1. 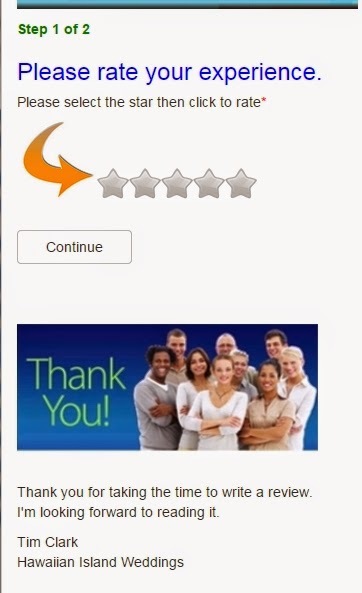 People feel like it's easy for companies to get 5 star reviews. False: Getting a 5 star rating on online review sites is difficult. Myth #2. Companies believe that traditional advertising is more effective than reviews. False: Customers respect good online reviews and often don't believe advertising. Myth #3. People think that online reviews are fake. False: Although there are some online reviews that are fake, 9 out of 10 reviews are genuine and given by real customers. Myth #4. Only customers who have had good experiences leave reviews. False: The fact is that many customers who have great experiences never leave reviews. It's often the customer who has had a bad experience with a company who is the first to want everyone to know. It's inevitable that there will be some bad reviews, if fact 95% percent of review readers become suspicious when only positive reviews are available. Myth #5. People don't really look at online reviews. False: 95% of customers use online reviews to select their wedding professionals. Myth #6. People don't trust online reviews. False: In a survey, 88% of consumers said that they trust online reviews as much as personal recommendations. Myth #7. Online reviews have no effect on whether or not they buy. False: The opposite is true, on-site reviews actually increase purchase rates by 60%. Many people ask me, "What's the difference between an online review and a testimonial?" An online review is posted to a real review site, like those listed above, and there are various safeguards to make sure that the reviews are real. For instance: Yelp won't even suggest a review unless it was done by a "Yelper" who regularly posts reviews; Wedding Wire requires that you list the date of the services; and Google requires you to have a Google account before you can write a review and can delete reviews that it doesn't think are legitimate. A testimonial is many times more detailed than an online review. A very happy customer may send a card or email to the company explaining how happy they are about the services. Normally, only happy customers write testimonials, but reviews are often written by clients who have had bad experiences. 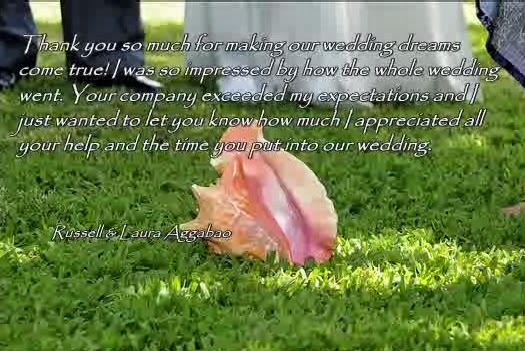 If you have had a wedding or event with Hawaiian Island Weddings, and wish to write a review or a testimonial, you can go to our Hawaiian Island Weddings Reviews page to rate your experience. If you would like to see our online reviews (good & bad), see our Reviews on Wedding Wire. See some of our Photography Testimonials. See our Testimonial Video below.